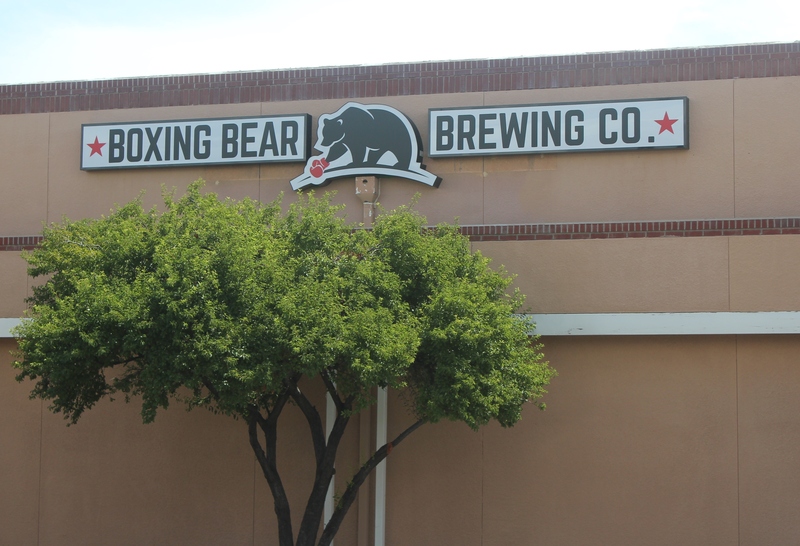 The Boxing Bear Brewing Co. is the latest brewery to open up on Albuquerque’s West side. Head brewer Justin Hamilton (former head brewer of Chama River) and his team opened the doors to the public on July 27, 2014. Since then, they’ve been slinging five of their own beers and a handful of local guest wares. I recently swung by the new brewery on my way back from a morning trip to Santa Fe. You know, I was just up there piloting a plane for the first time, no big deal. With that humdrum out of the way, it was time for a second adventure. Making my way to the intersection of Coors and Alameda, it was pretty easy to spot Boxing Bear. What took me by surprise, however, was the fact that there was a new Southwest Grape & Grain store next door. This is a name likely familiar to other local home brewers such as myself. Had I done my research beforehand, I would have known that our friendly new neighborhood brewery was in fact a collaboration. To me, this is a great sign. It means that not only is it convenient for a home brewer to grab a drink as they are picking up supplies, but also that Boxing Bear stands so strongly behind their beer that they almost dare you to try and make something better. Something that may catch a few folks off guard is that the entrance to Boxing Bear is not under their great big sign. Rather, one has to stroll north around back and meander through Boxing Bear’s spacious patio picnic area (complete with a small stage). This probably wasn’t a bad move, and if I wasn’t there on a Friday afternoon I could easily imagine it filled with happy patrons and a live band. Once I finally breached the front door, I noticed the entry way. To my left was a grand 10 barrel brewing system, with room for more. I stood and admired the stainless steel and Pyrex, and had there been some brewing going on when I walked in, I may never have made it to the bar area. Mental note: come back and watch some professional brewers work their malty magic. After finding a table, I ordered up a flight of all the house beers. The dining/bar area was quite large, made even larger in appearance by the wall-length mirror that I only noticed when I was getting a cup of water to cleanse my palate between samples. Apparently, the attractive man checking me out when he too was getting water, was simply an illusion. Time to settle in and meet the beers. From left to right on the flight I sampled the following. Hairy Mit Hefe 5.4% ABV 12 IBU: An apricot/blond colored smooth traditional Hefeweizen with light carbonation, a good mouth feel, and a pleasant nose of cloves and banana. Quite tasty indeed. East Kent Ale 5.3% ABV 35 IBU: A golden/orange ale with a strong, but welcomed, aroma of hops. A very nice balance of bitter and malty. This could easily be considered an “East Coast IPA” for our non-NM friends who just don’t get bitters. Paw Swipe Pale Ale 5.2% ABV 45 IBU: This is the type of beer that I consider to be the pinnacle of “lawn mower beer.” It is exactly the sort of thing you’d want to be drinking outside on a hot day under the duress of yard work. Heavily influenced from what I’m guessing are Cascade Hops, this beer has a lovely crisp citrus-like flavor and a slight bite at swallow, but overall finishes quite nicely. Bear Knuckle Double IPA 9% ABV 100 IBU: This is the beer in the bunch that took me the most by surprise. I’m traditionally not huge on IPAs, especially those boasting 100+ IBUs. This beer, unlike some other hop forward beers, I found to be quite pleasant. The bitterness isn’t overwhelming, and is – in my opinion – well balanced with the stronger than expected malty undertones. I’d even contemplate bringing a growler of this stuff home with me. Which are strong words coming from a non-IPA guy. Black Bear Stout 65.3 ABC 100 IBU: Ah, dark beers. This is where I’m the most at home, and probably also the pickiest. Without a doubt, this was a stout. A blind man could tell you from sight alone. The Black Bear has a strong nose of coffee, smoke, and other earthy tones. It was bit lighter in body than I generally like in a stout, but it still had the creamy, lacy finish that one would anticipate. I could see this beer coming out on Nitro (hint hint) pretty easily. The smokiness of this beer was almost as strong as the malt, but not to a point of being overwhelming. 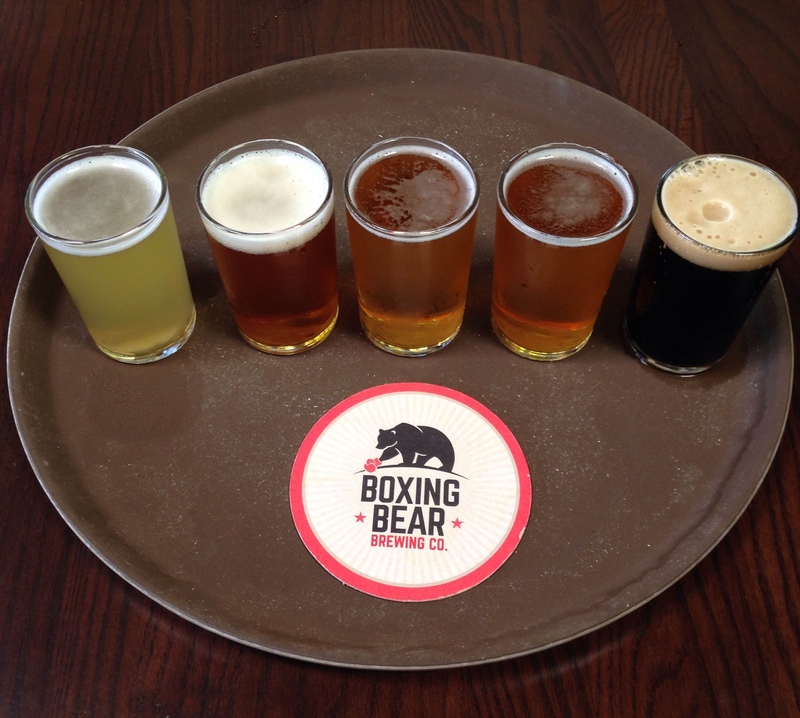 Though Boxing Bear only presently has five of their own beers on tap, I was told that an IPA and a Summer Ale were to be expected soon. They also expect to have a rotation of a few seasonals as time goes on. What’s interesting is that Boxing Bear also has their wine license. So we can expect wine, cider, and meads to be available. At the moment, they are also offering some guest beers from Bosque Brewing, Chama River, and Turtle Mountain, along with some wines from Black Mesa, Alta Canyon Cellars and Santa Fe Vineyards. Beyond the standard booz-ohol, Boxing Bear also offers an array of reasonably priced sandwiches completed with pickle spear and a bag of kettle chips. They even have a vegetarian option. It would be nice to see them offer appetizers or other snack food as well. Hopefully that option is coming soon. The staff of the brewery was very open and friendly. They were even willing to investigate further when they didn’t have answers to my questions. I don’t know if any of this was because I was madly scrawling notes into my pirate-themed spiral notebook as I was sampling beers. This is absolutely a place I will return to. 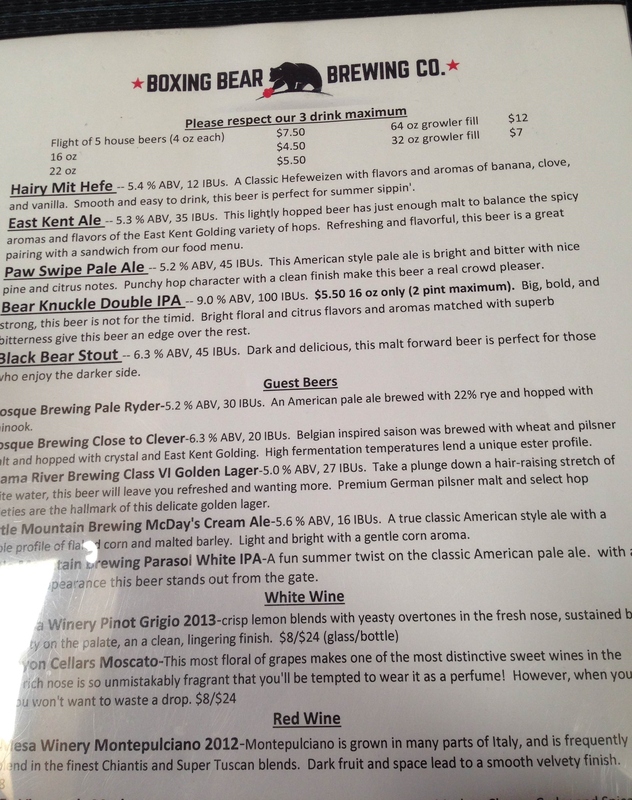 Oh, and about the name Boxing Bear… apparently Justin, the head brewer, has two dogs. One is a boxer, the other a great big fuzzy thing that looks like a bear. Great post! I love checking out breweries on our travels and I love dark beers. I definitely be visiting this one on my way back south through NM. If you are big into dark beers you should also check out Il Vicino Canteen (http://brewery.ilvicino.com/) when you’re passing though. It is my opinion they do some of the best dark beers in the state. Likewise La Cumber (http://www.lacumbrebrewing.com/) is just down the street, and they are pretty good as well, especially their stout that occasionally shows up on cask. It is a strong one, and it has the ability to go down a bit too smoothly if you aren’t playing attention.